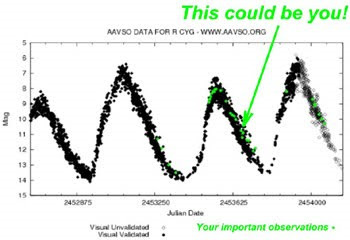 There has been some recent discussion on the Citizen Sky website about looking at the light curve or checking the quick look data of a star you are observing. The main concern revolves around observers having too much information, or a preconceived notion, before making an observation. We call this bias. The term biased is used to describe an action, judgment, or other outcome influenced by a prejudged perspective. In variable star observing, or any scientific investigation, bias is a bad thing. Half the fun of variable star observing for me is precisely the fact that I don’t know what my favorite variable star is doing at any given moment for sure. It’s why I climb out of bed in the middle of the night in the winter to go observe them. I can’t wait to see what they are up to. If I already knew, or thought I knew, there would be no reason to lose sleep. So the first part of my advice is simple- don’t look at the light curve or recent data on a variable star you plan to observe before you observe it. You risk biasing your observation, and you’re missing out on the fun. The science is usually the reason people start doing this, and the fun they discover along the way is why they keep doing it for years and years. To risk either is, well…stupid! By all means, when you are done, and have reported your observation, go look at how it compares to other observers’ data and see where it fits in the light curve. This is valuable feedback, you’re probably going to be quite happy with your result, and you can be proud of your contribution to science for the night. If your observation looks different than other observers, don’t worry too much about that either. Don’t assume the other guy is a better, more experienced, more correct observer than you, even if he used a CCD or the Binford 9000 photometry device. He could be a half-blind, one-eyed village idiot for all you know. The other guy or gal might not even have been looking at the same star you were. Rule #1- Be sure you are measuring the right star. Always be very conscientious when identifying the variable. There is nothing more useless than an observation of the wrong star! Rule #2- Report exactly what you see, not what you think you should be seeing…period. This may be difficult for some people, so here are some tips for overcoming your preconceived notions. 1. Assume they are lying to deceive you! 2. Know they are bad observers, so their opinion is worthless! 3. They could be, and probably are, completely crazy. How many variable star observers have you met? I rest my case. 2. You are a bad observer (you should know!) and your opinion is worthless. 3. You are obviously schizophrenic – you are in fact crazy! Rule #4- We never know for certain what a variable star will do from moment to moment. 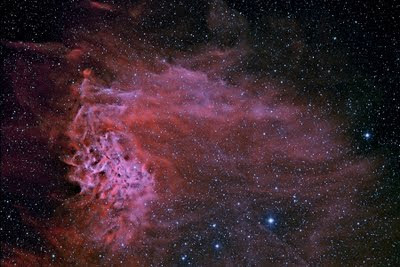 Therefore, you can never be certain what your star is doing at any given moment, that’s why we do this. This can be added to the reasons bias should be avoided. Rule #5- Make every observation as if you are the only one looking at your star at this moment. You may not have to pretend. The number of variable star observers worldwide is so small this is often the case. You are special; don’t forget that. For astronomers, the universe is our laboratory. It’s beautiful, mysterious, impressive, awe-inspiring, and humbling, and it’s ours. Enjoy it. Excellent set of rules, Mike. Particularly to us visual-only observers who easily fall prey to the deception our eyes and minds like to play on us. I admit that I've (more than) occasionally fallen victim to bias. And I admit that if I've been unable to overcome my bias I simply ignore the observation and give itanother look later, perhaps after another few obs on different stars or on another night when I've forgotten what my original bias was. This blog is gold. Keep up the good work! Thanks Mike for those rules. As a new visual observer like me, i find these rules very useful. How can i make any good observations if i know what to expect? And where is the fun to know that oh yes indeed its 9mag precise. And thats a way to make good observations.